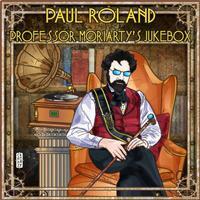 Paul Roland’s brand of music is somewhat predictable, but never redundant or monolithic. You can always figure that the songs will be based on stories or legendary (real or otherwise) characters or events. It tends towards spooky, or creepy subject matter. The music lands in a proggy territory, often close to folk prog. I generally put this stuff under prog, but I could see someone disagreeing with that assignment. I think that this might be my favorite set of his to date. A rocking guitar opens this. As this works outward violin and more in the arrangement bring it more into the realm of hard rocking prog. The violin on this definitely helps to make the cut. It’s a very British sounding rocker. Acoustic based, there is a real folk prog vibe to this. World music shows up in the mix, too. It’s quite a theatric piece. This rocker is fun. It’s not the proggiest thing here by any means, but it’s good. More of a folk prog ballad type piece, this is a nice touch. It’s quite theatrical. I wonder how many songs have been written about this guy? This one is theatrical and British. It’s a good rocker with a lot of folk in the mix. This is very much in keeping with the folk prog concept. It’s a creepy tale. More of a straightahead rocker, this is good, but not what I’d consider a standout. A very British rock tune, there are some overtones that bring the proggy elements to the table. Violin adds a lot to this powerful cut. It’s another that has a lot of that folk prog vibe to it. This is a smoking hot rocker. It’s got a great riff and groove. It’s not prog, but it’s fun. Very much a folk prog piece, this is very old world in nature. It’s not one of my favorites, though. The jams later in the piece make great use of the old world instrumentation. More theatrical folk prog, this is fun. This is a folk prog type of cut, too. It’s about Jack the Ripper. It’s actually pretty, in contrast to the lyrical content. Those lyrics get a parental advisory, too. More of a rocking tune, this works pretty well. It has world music and more in the mix and a lot of charm and charisma. I’ve reviewed the other version of this previously. I really like this version. It’s got a creepy kind of vibe to it and works really well. Very much a theatrical folk prog type piece, this is pretty catchy in a lot of ways. The main musical concept isn’t altered much here, but this is a solid piece. I don’t really like this one very much. It seems too sparse and just not all that interesting.